Alex Caruso gives it to Kentavious Caldwell-Pope who drives to the rim with force for a loud dunk. Kentavious Caldwell-Pope pokes the ball free and LeBron James takes it the other way for a 2-handed slam. Kentavious Caldwell-Pope challenges the 7-foot-1 Thon Maker above the rim and comes away with the posterizer. 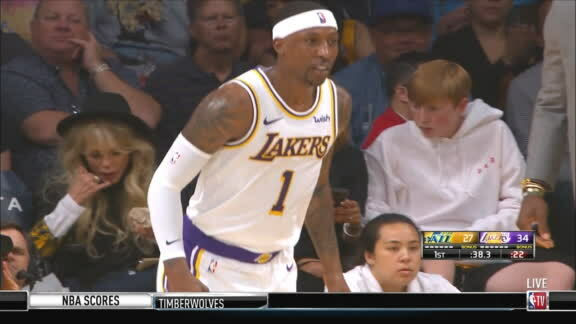 Kentavious Caldwell-Pope shows good hands on the steal leading to a transition dunk, forcing the Bulls to call a timeout as the Lakers are on a 15-2 run.